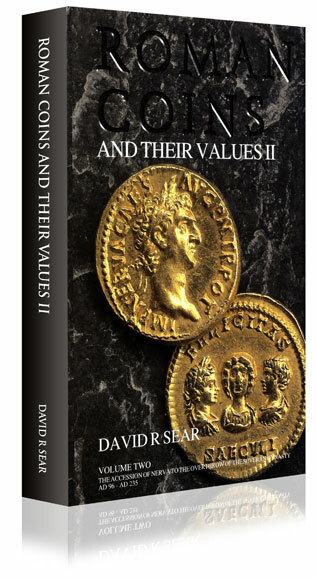 Volume II now extends coverage of the Imperial series from Nerva, the 'thirteenth Caesar' and first of the 'Adoptive' emperors, down to the overthrow of the Severan dynasty in 235. It encompasses what may justifiably be termed the ï¿½golden ageï¿½ of the Roman imperial coinage. The full development of the Augustan system of coin denomination and perfection of the method by which government propaganda was communicated to the citizenry through the medium of coinage both reached their peak during these fourteen decades. The preceding coinages of the Julio-Claudian and Flavians periods had seen much experimentation with the currency system and tentative early steps in the development of the propaganda potential of the reverse types. The coinages of the Adoptive emperors and those of the Antonine and Severan dynasties saw the ultimate fulfilment of this process resulting in a coinage of unprecedented volume and complexity. The number of types included in the listings shows a dramatic increase and the proportion of illustrated coins is much greater than before. Throughout the catalogue the current market valuations have been expressed in two currencies (pound sterling and US dollars) and in at least two grades of preservation - usually 'VF' and 'EF' for precious metal coins, and 'F' and 'VF' for the billon and bronze issues of Roman Egypt. For regular aes denominations (sestertii, dupondi, asses, etc.) valuations in three grades ('F', 'VF' and 'EF') have normally been provided. Another feature not present in earlier editions is the inclusion of the mint and precise date of each type. The biographical sketches at the commencement of each reign and under certain subsidiary headings have been fully revised. Hardback with dust jacket, 696 pages, black & white illustrations.